Upon his restoration to the crown in 1660, King Charles II granted a patent to Sir Thomas Armstrong to ‘coin farthings’ for the next twenty years and all other (unofficial) farthings were to be prohibited. In 1662, another patent was issued granting the coining of Irish groats (four pence), threepences, half-groats (two pence), pennies and halfpennies. 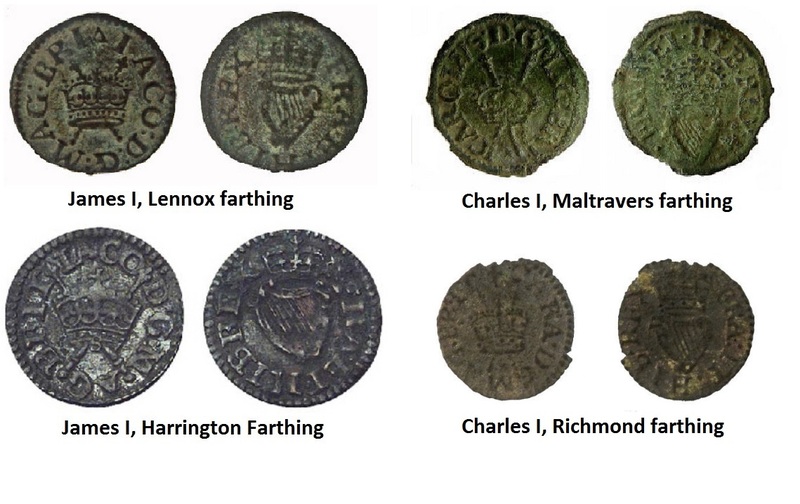 Armstrong’s Irish farthings were ‘in the style of the earlier English royal farthings’ of James I (Harrington & Lennox patent farthings) and Charles I (Maltravers & Richmond patent farthings) but they were heavier and made from better produced dies. In short, they were of much better quality and much more likely to be accepted by the people than the previous flimsy attempts at introducing small denomination coins into circulation. What makes this (Armstrong) coin special is that it was ‘issued for use in Ireland’ whereas the earlier James I and Charles I farthings (1613-1622) were explicitly designated as ‘the only English coin not authorised for circulation in Ireland’. This policy led to a chronic shortage of small change in Ireland and a profusion of over 800 different types of ‘unofficial farthings’ which mostly comprises mostly ‘under-weight’ pennies and some higher denominations. They are known ‘farthings’ because they were usually roughly the same size + weight as a ‘regal’ copper farthing. The Armstrong farthing is almost identical in design with the Harrington farthings previously described and from the occurrence of a capital R, on the jewelled band of the crown, on the obverse, it would appear that the dies from which it was struck were the work of the famous engraver, Thomas Rawlins. Silver proofs exist for this coin but they are very rare. Despite Sir Thomas Armstrong being one of Ormonde’s most trusted officers during the Great Rebellion of 1641 and the subsequent over-spill of the English Civil War into Ireland from 1648 onwards, James Butler, (Earl, Marquess and Duke of Ormonde) obtained a ‘king’s letter’ from Charles II granting him sole authority to suppress all tokens in Ireland that did not have his approval. Butler’s ‘letter’ might have been to prevent his heirs from continuing their father’s potentially lucrative patent..
As such, he opposed the use of Armstrong’s farthings in Ireland. Such an instrument is usually followed by a proclamation pertaining to a new coinage – a strong indication that Ormonde himself intended to, or had secured preliminary support to issue copper money. Armstrong’s copper coins were struck in 1660-1, but Ormonde opposed these small pieces and few reached circulation. It is shortly after this, that the ‘mysterious’ St Patrick’s Farthings appeared … but that topic is for another day ! It is thought that these copper coins might have also circulated in the American Colonies, since one 1681 Irish halfpenny was found in the Philadelphia highway hoard. They do not seem have circulated as widely as the St Patrick’s coinage, Wood’s coinage or the Voce Populi coinage – all of which are included as ‘de facto’ American colonial coins in most catalogues. Who was Sir Thomas Armstrong? Sir Thomas Armstrong was an English officer of obscure origin serving in the Dutch army. It is thought that his family were originally from Burbage, Leicestershire, in the English midlands. He fought in the Thirty Years War between 1633 and 1638 in The Netherlands. On 29th July 1649, Colonel Thomas Armstrong and a party of skirmishers driven back from Dublin (after Col. Jones had landed in Dublin and taken it from Ormonde). A nephew of Col. Jones, who had gone over to the Royalist side, was captured during this engagement, returned to Dublin and hanged for desertion. Between 7-13th August 1649, Col. Jones advanced on Drogheda. The veteran Sir Arthur Aston was then appointed Governor of Drogheda while Ormond returned to Tecroghan to continue his attempts to recruit a new field army. Ormonde claimed he had lost less than a thousand men. On 23rd August 1649, On 23 August the Royalists held a council of war at Drogheda, present at which were: the earls of Castlehaven and Westmeath, Sir Arthur Aston, Sir Thomas Armstrong (Quartermaster-General of Horse), Sir Robert Stewart and other Royalist leaders. As Inchiquin’s largely mounted force came into view, the English hurriedly deployed on a beach, their backs to the sea. As the Irish were ordering themselves in preparation for an attack, the 350 English horse charged, hoping to catch the enemy by surprise, but were successfully repulsed on two occasions. After the second failed charge, Inchiquin launched a full cavalry assault on the horsemen. Demoralised and outnumbered, the English horse fled back towards the infantry, with the Irish in pursuit. The highly disciplined English infantry opened up their ranks to allow their own horse to pass through, after which the gaps in the ranks were closed once more. Inchiquin’s charging cavalry now unexpectedly found that the retreating horse had disappeared, to be replaced by a mass of pike-heads and levelled musket barrels. Close range musket fire tore into the Irish cavalry, throwing them into disorder and leaving the beach bloodstained. The English cavalry then counter-attacked, forcing the Irish to retreat. He (and his wife, Anna Anderson) had three children and one of them was just as controversial and adventurous as his father. He married Catherine, daughter of James Pollexfen and niece of Edward Hyde, 1st Earl of Clarendon. Following the Restoration, he received, in February 1661, a commission with the Horse Guards. In August 1675, Armstrong killed the son of one of the queen’s ladies-in-waiting at a London theatre. Armstrong was pardoned on the grounds that his opponent had drawn first. Armstrong served with James Scott, 1st Duke of Monmouth in France from 1672, fighting at the Siege of Maastricht (1673) and alongside the Dutch, in 1678. He was wounded at St Denis. In 1679, he helped suppress the covenanter rising and fought at the battle of Bothwell Bridge. Monmouth’s influence secured him as MP for Stafford in March 1679 to the First Exclusion Parliament. Interestingly, from an Irish numismatic viewpoint, a patent was granted to him (and a Colonel George Legge) to produce Charles II’s regal halfpennies and they were minted for the years 1680, 1681, 1682, 1683 and 1684.